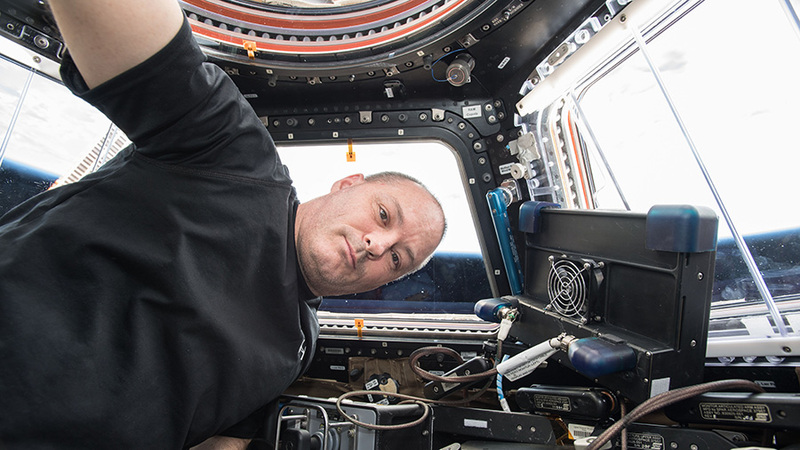 NASA astronaut Scott Tingle is inside the International Space Station’s window to the world, the seven-windowed cupola, where astronauts operate the Canadarm2 robotic arm to capture visiting vehicles such as the SpaceX Dragon, the Orbital ATK Cygnus and Japan’s H-II Transfer Vehicle. Three new Expedition 55 crew members are beginning their first full workweek aboard the International Space Station. They and the rest of the crew are getting ready for a spacewalk on Thursday and next week’s arrival of the SpaceX Dragon cargo craft. NASA astronauts Ricky Arnold and Drew Feustel are preparing for a spacewalk just six days after arriving at their new home in space. The duo reviewed their spacewalk procedures today with fellow astronauts Scott Tingle and Norishige Kanai. The veteran spacewalkers will install communications antennas and replace a camera assembly during the excursion set to begin Thursday at 8:10 a.m. EDT. NASA TV broadcast the spacewalk activities live beginning at 7 a.m.
Expedition 55 Commander Anton Shkaplerov has been packing a Russian resupply ship with trash and old gear readying it for its departure on Wednesday. The Progress 68 (68P) cargo craft will undock from the Pirs docking compartment Wednesday at 9:50 a.m. It will reenter Earth’s atmosphere April 25 for a fiery demise over the Pacific Ocean. The 68P has been attached to the station since Oct. 16. The next cargo craft due to resupply the station is the SpaceX Dragon. After its launch April 2 at 4:30 p.m. Dragon will take a two-day flight to the station. The commercial cargo craft will be robotically captured and installed next Wednesday at 6 a.m. to the Earth-facing port of the Harmony module. Kanai and Tingle will be at the robotics controls inside the cupola when they capture Dragon with the Canadarm2 robotic arm. The duo practiced the Dragon rendezvous and capture procedures today. The crew has also been configuring the orbital lab for the new science experiments Dragon is delivering next week. Praying that the cargo crafts’ arrivals come and go without a hitch. I’m a proud grandparent, I try a lot to convince my kids to become involved in ‘anything aero-space’; and I think it’s working. All the power to NASA. Study hard especially math and science. Try to learn engineering. Gettin involved in Aerospace wont hurt. Make contacts and exploit every opportunity that might lead to your goal! Wishing you the best! I want to be a astronaut. How can I join the Rocket Science. I am very interested in this Program.